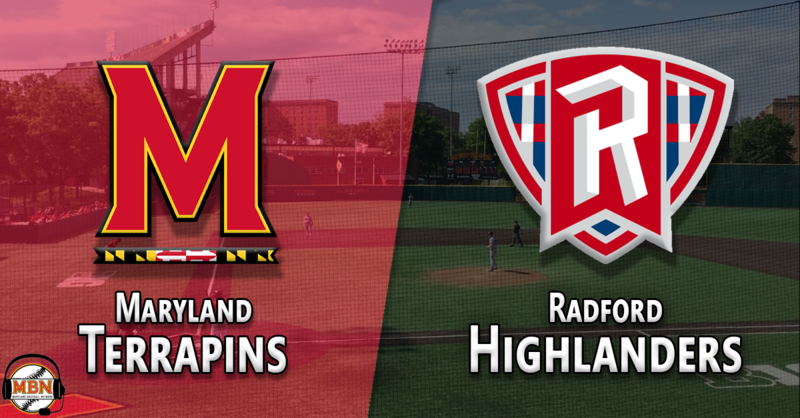 Kevin Biondic’s eighth-inning RBI double broke a late tie and sparked a six-run rally, as Maryland defeated the Radford Highlanders, 11-4, Friday afternoon. The victory, in the opening game of the Johnny Gardner Law Group Tournament in Conway, South Carolina, was the third straight for the Terps, who climbed over .500 at 5-4 on the season. Biondic collected three hits in the contest and Nick Dunn and Randy Bednar each hit three-run homers as the Terps plated nine runs in the final two innings to back up Taylor Bloom’s eight strong innings. Just as in previous games, the Terps struggled to come up with the key hit early on, but the bats came alive to score six runs in the eighth inning to secure the victory. Their patient approach paid off, as they drew ten walks to complement their nine-hit effort. Locked in a 2-2 tie heading into the eighth, AJ Lee led off with a triple off the center field fence. Biondic followed with a ringing double into the left field corner to score Lee and give Maryland the Lee. Pinch hitter Will Watson walked, and after a sacrifice bunt, Biondic came home on a wild pitch. Randy Bednar and Marty Costes then drew free passes to load the bases. After Zach Jancarski drove in one with sacrifice fly, Dunn launched his team-leading fourth homer of the year over the right field wall to break things wide open for an 8-2 lead. Maryland had early opportunities to score, plating runs in the third and fourth innings to take an early lead. Down by a run in the third, Richie Schiekofer drew a leadoff walk for the Terps, and Justin Morris followed with a line-drive single to right. Schiekofer moved up to third on Randy Bednar’s fly out to center, and Marty Costes drove him home with a sacrifice fly to knot the score at 1-1. The Terps then loaded the bases for Taylor Wright, but the cleanup man popped out to end the inning. Highlanders starter Ryan Sande, struggling with control, walked Lee to open the fourth. It was the third straight inning that the Radford right-hander opened with a walk. Biondic followed with a single up the middle, and Sande was removed in favor of left-hander Andrew Nardi. The Terps couldn’t get anything going offensively for the next three frames but broke out in the eighth against Nardi (1-2) and his fellow Radford relievers, Evan Treehouse and Kyle Palmer. Bednar added a three-run homer – his second long ball of his young college career – off Cody Boone in the ninth to give the Terps double-digit runs for the second time this season. On the mound for Maryland, Bloom (2-0) turned in a third straight solid start in Friday’s contest. The senior, who entered the contest with a 2.57 ERA in 14 innings so far this season, allowed four runs (three earned) on six hits over eight innings. After a 1-2-3 first inning, Bloom got two quick outs in the second inning. He coaxed a ground ball to short for the potential third out, but AJ Lee threw wildly to first, extending the inning. The next hitter, Highlanders’ third baseman Matt Roth, doubled off the wall in left center, scoring the runner from first to give Radford an early 1-0 lead. The right-hander shut Radford down after their second-inning tally, allowing just three baserunners over the next four innings before running into trouble in the seventh. Roth singled with one out, and Luke Wise’s two-out triple tied the game. After Maryland’s eighth-inning rally, Bloom returned to the mound with an 8-2 lead. He gave up a two-run homer to Andrew Szamski two batters into the eighth, but retired the next three batters quickly to end the inning. Biondic threw a scoreless ninth to close out the victory, keeping the two-way man’s season ERA at 0.00 through seven relief innings. The Terps will look to stay hot Saturday when they take on Coastal Carolina at 3 p.m.